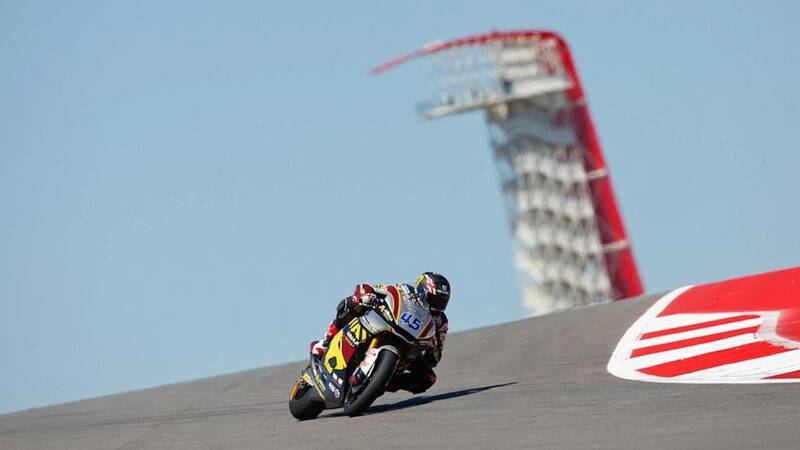 The talk of the paddock during Austin’s first MotoGP of the Americas was how difficult COTA is, not only to ride, but to learn. We spoke with a few rider coaches to find out how they’re preparing the racers they work with. Danny Walker, founder of American Supercamp, a dirt track school. Danny: Back in the day, all the top US roadracers started out in dirt track. Now we teach it to anyone. We’ve found any type of rider can benefit from it. RideApart: A lot of people said Rossi didn’t do well on the Ducati because it requires more of a flat track background, and that’s why Hayden has done well on it. Danny: Rossi’s actually a dirt tracker at heart, he has his own flat track. RideApart: But he didn’t do it as a kid, that makes a difference. Then it’s in your DNA. Danny: Yeah, when you grow up that way it becomes a reflex. RideApart: Let’s talk about this track. You’re working with some racers who are coming to this track for the first time and it’s on a race weekend, with the whole world watching. RideApart: Totally, you can break it down by braking points, corner entry, apex, etc. Danny: Exactly. There are so many similar corners around the world. Obviously Laguna has the corkscrew, there’s nothing else like that, but this track has so many corners that are not like any corners anywhere. They have to approach it one corner at a time, instead of trying to put every lap together. It would be overwhelming, especially for the younger riders. RideApart: Absolutely. Even Cal Crutchlow was begging his twitter followers earlier this week for the PS3 car race from this track, it’s cars but it’s still the track. As far as the race weekend, do you see a lot more people doing the track walk on scooters and bicycles at this track? Danny: Yes, we walk the track, and that’s one of the things I really miss about Simonicelli. We’d be out walking the track, and we’d always see him out there running the track. He’d blow by us. I’d sometimes try to run with him, but couldn’t last more than 10 feet. So what we say to our riders is to always make sure you’re on the right line. We walk the track ON the line. Don’t even let your subconscious be ok with the wrong line. RideApart: As a club racer and at track days, I’ll sometimes take the wrong line to make it easier for people to pass me, knowing I’m slow enough to take a different line. As I build speed I take up more of the track, but at low speeds I like to be easy to pass and predictable. But at this level, there’s none of that. 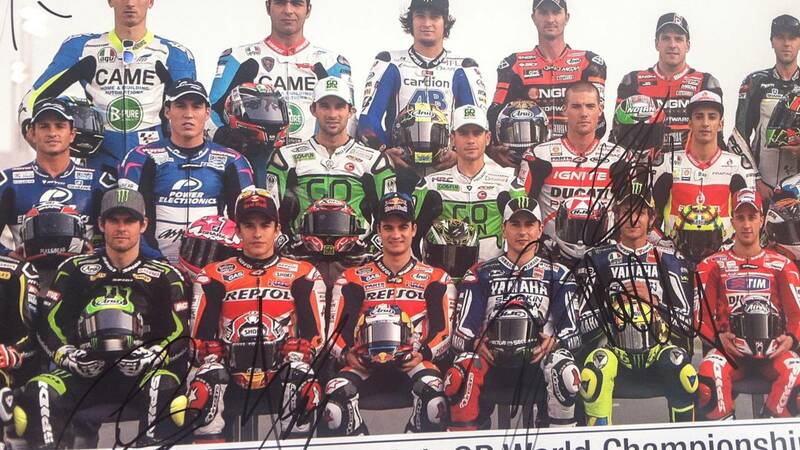 Danny: Yeah, some of the more polite Elder Statesmen of MotoGP may do that, but they don’t need much room at that level. So it really comes down to practice, then. At this track, you can’t even compare the turns to other turns. We’ve been working with our riders to develop their peripheral vision. It helps their senses become more attuned to the entire track. Your reflexes are faster in your peripheral vision. RideApart: What are your predictions for the races tomorrow? Danny: Marquez is riding really aggressive, it’s unnerving. I hope he doesn’t crash again! The Yamaha’s are riding really hard but not pulling as much off the corners. RideApart: What would it take to get more Americans involved in this level of racing? Danny: I literally just had that conversation with Peter Clifford, who runs the Red Bull Rookies. There isn’t such a series in the US, the two-stroke 125s these kids used to start out on have gone away. RideApart: I beg to differ, there’s clubs like M1GP, Chuckwalla and Motoyard with 250 classes. Danny: Yes, but those are production classes. For this to truly prepare young racers to go pro, you need something a little more high level. There are some people who really want to make a national 250 production class exist alongside the AMA series. The biggest issue is production vs the sorts of bikes the Red Bull rookies are on, which cost a lot more. We’ve been approached by a few different people to make this happen. Stefan Prein, MarcVDS team rider coach works with Moto2 racers Mika Kallio and Scott Redding. Scott Redding on his way to 5th place. RideApart: Word on the street is that this track is like no other track on earth, and therefore really hard to learn. How do you guys start your weekend, to familiarize yourselves with the track? Stefan: When we arrive on Wednesday, we walk the track with the riders and chief mechanics. We can break it down and say “Oh, this corner is like that one at Silverstone, etc.” and look at camber and such. But then we have to see how it flows, then sort out the gearing in practice. Then finally to finish with a pole position (Scott Redding), we feel we’ve done quite good. RideApart: Yes, great job! Danny Walker told me something surprising, that when he walks the track with his riders, they walk on the actual racing line. Stefan: We don’t do that, unless we’re on a scooter. We walk all over and look at the corners from different angles. RideApart: Yes, and I noticed in the Red Bull Rookies race they seem to be all over the place, going over the paint with impunity. Stefan: The paint is quite good, has great traction, so you can really go over it. But still you don’t go over it at an angle. RideApart: Your riders are quite different physically. Mika’s a small guy, Scott is quite big. What do you recommend to them about body position and such? Stefan: Some racetracks, like T4 here, Scott has a real advantage because he can put more weight to the inside, being so tall and able to get so much of his upper body off the bike. Mika can try, but it’s harder. 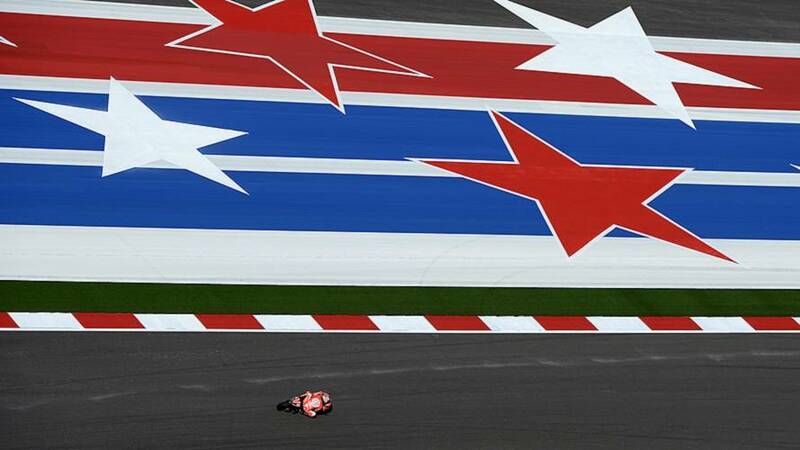 You know who did a great job with this is Marquez. He moves his complete upper body off the bike, and it’s served him well. RideApart: You may notice Marquez dragging his elbows, a tall people trick I haven’t seen from a rider below 5’10, so it’s pretty amazing to see him do it at 5’5. RideApart: I’m a big fan of the school, I’ve done it three times and found it helped me immensely in improving my technique both on the racetrack and in the canyons. You’re here working with some of the racers, helping them find their way around these completely unique corners? Keith: The designers of this track fulfilled what I wrote in my first “Twist of the Wrist” book, in setting it up so it’s really deceptive. For example, T1-9, it’s very stop and start, doesn’t flow as much, it’s very chopped up. What it looks like and how you ride it are completely different. It’s hard to tell how fast you’re really going to go on this track. It’s very deceptive, the people who designed it are really cool. The elevation changes create their own problems- you don’t know where you’re going. RideApart: But that makes it more fun. Tracks without elevation changes are kinda boring. Keith: Yes, that definitely makes it more challenging. Although, flat-surface tracks have their own problems. With hills, you can see more from the top, but when you’re flat, and at full lean angle, all you really see is a sea of asphalt. That makes it harder to see ahead, making it an interesting problem. Nobody likes the hairpins because they’re so tight and so unfamiliar. There’s nothing like those on any other track, so it’s taking some getting used to. RideApart: What riders are you working with and what are some of the things they’ve liked about this track? Keith: I’m working with Karel Abrahams, who broke his collarbone today when he got tangled up a slower rider who clipped him. I’m also working with Joe Roberts, a Red Bull rookie in his third season. He’s getting on really well with this track. In yesterday’s race he started 16th, and made his way up to 4th place. Then he lost the front and crashed out. But that’s racing. He was able to not follow the other riders, and really use his own line. That’s how he was able to get through 12 riders, finding his own way. It was really encouraging to see him do so well. I called Prussiano, thinking he’d be at the track, but he called me back from the Boot Camp where he was preparing for the next day’s class. James Rispoli (43) passing Taylor Meyers (112) at TTBC. 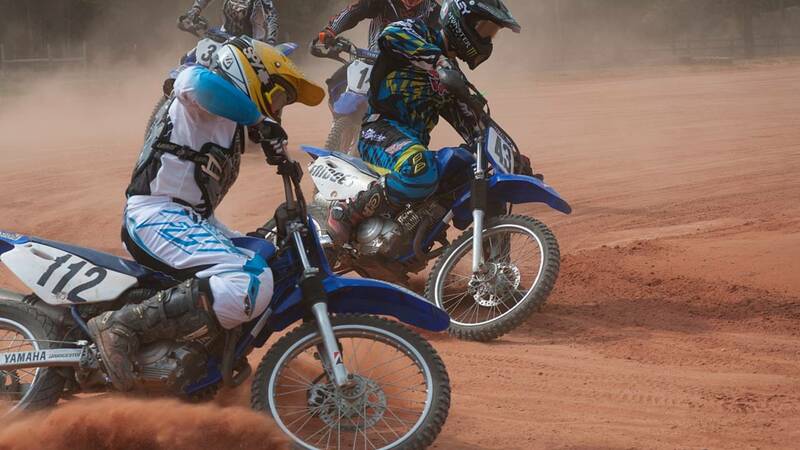 RideApart: Who goes to Texas Tornado Boot Camp? Joe: We mainly train racers, everything from beginner to pro racer. Our average client is a 40-something track day & street rider. RideApart: What are some of the biggest things you see racers needing help with? Joe: We work with our students to minimize time between braking and opening the throttle. For example, we have them trail brake up to the last minute to the apex, providing some sort of input at all points, not just sitting along for the ride. It doesn't have to be a lot of input, it could be as little as 2%, even neutral throttle to set the bike in the correct position. This puts an end to the ol’ mid corner correction that plagues a lot of riders. RideApart: What sort of improvement do you see in their lap times at the camp? Joe: Someone less experienced, it's major, like 20 seconds. But with experienced racers it's a finer adjustment. The biggest thing with pros is shown more over time. By their third or fourth visit we see remarkable improvements. Cory West and Dane Westby are perfect examples of this, as they’ve been to the camp a few times. Dane was "whiskey throttle" he was always applying at least 50% and therefore wasn't smooth & consistent. As a result, he fell a lot. But now Dane can open it as little as 2%, for better control. RideApart: What would you recommend to students, particularly at a new track like this one? Joe: First — pick your battles on the track map. Find the most important corners, the longer, faster ones, and the ones that lead on to a long straight. then, (pauses to go fill the water truck)... go to those corners and analyze them more closely, you can get a better perspective of the camber walking than you can on the moto at speed. Then, while learning any new track, learn the corner in reverse, know where you need to be at the exit. Then you find your apexes, then once you've found your turn in point, you can find your brake marker. Go in soft while learning, to be able to make mid-corner corrections while learning. There’s an old saying- you learn how to ride on the dirt, then show what you've learned on the asphalt. On a street bike, when you exceed the traction limit, the reaction has to be instinct, not a thought process. Practice at 15mph, then your body responds automatically the right way. RideApart: That’s exactly why I’m looking forward to taking your school, and getting myself out to the dirt more often. In over 25 years of riding, I’ve become paranoid about losing traction. To the point where I know I’m too scared. Then last year I bought tires that don’t heat up like the tires I’m used to, and highsided on a cold winter’s night, just making a left turn in town. I know that highside could’ve been a lowside if my instinct hadn’t been to chop the throttle closed. That’s why I’m stoked about playing in the dirt on my Zero FX- to get comfortable with that slide, to let it happen then gradually reign it in, instead of panicking.